The Red Cross Wants Games to Respect The "Rules of War"
The Red Cross thinks virtual soldiers should be held to the same standard as real ones. The Red Cross believes international "laws of war" should feature a more prominent role in games where players engage in realistic combat scenarios. The international aid organization, which plays a role overseeing international law as per the Geneva Convention, believes that some games depict war too well to ignore proper battlefield conduct. "Video games that are representing battlefields, contemporary battlefields, are very close to reality," Senechaud told the BBC. "And actually it's very difficult to tell the difference between any real footage and the footage you can get from video games. So we are arguing that we have to get even closer to reality and that we have to include the rules of the laws of conflict." While some video games penalize players for hurting civilians, few actively acknowledge the soldiers that there are rules of engagement dictating who soldiers can shoot, and when. In the real world, shooting civilians or even armed combatants without cause, could be considered a war crime. The ICRC hopes developers will avoid putting players in situations where they may be praised or rewarded for reckless behavior in combat. 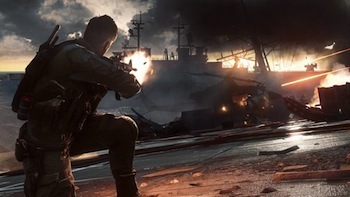 Obviously it would be ideal if video games, especially violent ones, could foster a more nuanced understanding of what it means to fight a war, but some games are better suited to such rules than others. The question is: Do developers have an ethical obligation to at least suggest players hold themselves to the same standards in a game as the world expects of real soldiers in the field?